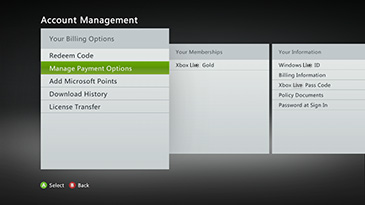 You can manage payment options for non-Xbox subscriptions (such as app subscriptions) from your Xbox 360 console. This page shows you how to add a new payment option, replace an existing one, or remove an old one. 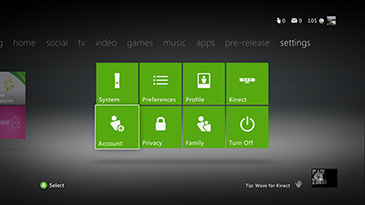 If the payment option you want to manage is for your child’s Xbox subscription, see How to manage your child's Xbox subscription. Note These steps are for adding a payment option that is not tied to an Xbox subscription. Sign in with your Microsoft account email and password. Select Add Credit Card, and then enter your credit card information. Select Add PayPal to use your PayPal account. Select Direct Debit to add a direct debit account (Germany only). Note These steps are for changing a payment option that is not tied to an Xbox subscription. Go to settings, and then select Account Management. On the Account Management page, select Manage Payment Options. Scroll right to Your Memberships, and then select the membership you want to update. Note If this option appears dimmed, you may have to select Modify Membership to select a plan, or go to Change a payment option on your Microsoft account, select Update a payment option on the left side of the screen, and then follow the instructions. Select the new payment option, and then select OK. Note These steps are for removing a payment option that is not tied to an Xbox subscription. Select the payment option you want to remove. Would you like to contact Support regarding the "Manage your non-Xbox subscription payment options on Xbox 360" issue you were reading about or a different issue?